26 Apr. 26 Aug. 26 Dec. If on any brother there be laid commands that are hard and impossible, let him receive the orders of him who biddeth him with all mildness and obedience. But if he seeth the weight of the burden altogether to exceed his strength, let him seasonably and with patience lay before his Superior the reasons of his incapacity to obey, with out shewing pride, resistance, or contradiction. If, however, after this the Superior still persist in his command, let the younger know that it is expedient for him; and let him obey for the love of God, trusting in His assistance. Today’s Chapter 68 (If a Brother Be Commanded to Do Impossibilities) must read in continuity with Chapter 5 (Of Obedience) and with the 2nd, 3rd, and 4th degrees of humility in Chapter 7 (Of Humility). It must also be read in harmony with the end of Chapter 49 (Of the Observance of Lent) and with Chapter 71 (That the Brethren Be Obedient One to the Other). Just as there is no better commentary on Sacred Scripture than Sacred Scripture itself, so too there is no better commentary on the Holy Rule than the Holy Rule itself. From all of these chapters taken together and understood each one in the light of the others, it becomes clear that, for Saint Benedict, obedience is the great sacrament of communion with Christ. By obedience, Christ gives himself to a monk; and by obedience a monk gives himself to Christ. 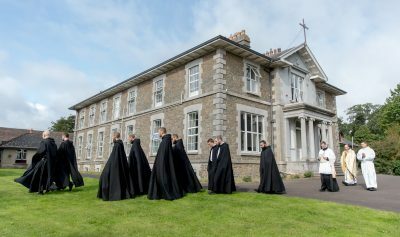 Blessed Marmion left his life as a diocesan priest of Dublin because he wanted something that only the cloister could give him: a life sanctified by obedience at every hour of the day and night, and at every minute of every hour. One can do many monkish things through self-will—fasting, abstinence, vigils, prolonged prayers, and hard labour— none of these things by themselves make the monk. On the contrary, they can redound to presumption, and vain-glory, and a hardening of the heart in spiritual pride. Only through obedience does a man become a monk in the Benedictine sense of the term. The man who thinks he can be a monk on his own terms—like the Sarabites and Gyrovagues—will be no monk at all in the sight of God and of His angels. The man who thinks he can live as a monk while writing his own ticket is fatally deluded. There is no security in following one’s own desires, even when one”s own desires appear to be reasonable, ascetical, pious, and praiseworthy. There is security only in obedience. Obedience springs from humility and is the most secure expression of humility. The prideful man instinctively recoils from obeying. He resents correction and resists it. The humble man jumps at the opportunity to obey. He welcomes correction, and is quick to put it into practice. It may happen that a brother is convinced that the thing he has been ordered to do exceeds his strength, or may be injurious to his health, or may put him under too great a strain. A brother may also think that the command given by his abbot is unwise, or untimely, or that his abbot is poorly informed or misinformed. In such circumstances, what should a brother do? First, he is to listen to the command of the abbot with an open mind and with a heart disposed to obey. The brother who begins to construct a whole series of objections in his head, while his superior is still speaking or before he has even finished speaking, is fundamentally recalcitrant and resistant. Saint Benedict says that a monk is to listen to his abbot with all mildness and obedience. This means that a monk receives his abbot’s instruction meekly and with and peaceful mind. A son of Saint Benedict is always eager to obey because, I have already said, obedience is the means by which Christ gives himself to a monk, and the means by which a monk gives himself to Christ. Lord Jesus Christ, without Thee I can do nothing, but thy grace is sufficient for me. Show thy power in my infirmity that I may obey, not out of fear, or by constraint, or by need of approval, but with good cheer, freely, and out of charity, trusting in Thy help.